The Etheridge district, about 250 km south-west of Cairns, came to notice in 1856 when Augustus Gregory charted the Gilbert River. Other explorers, mainly with pastoral ambitions in mind, travelled through the district in the 1860s, and Richard Daintree made several journeys in 1866-69. Daintree teamed up with a pastoralist, William Hann, and made geological, pastoral and photographic forays into north Queensland. By training he was a metallurgist, and had been the assistant Victorian government geologist. Daintree, appointed as Queensland government geologist, Northern Division, in 1868, found good indications of gold at the headwaters of the Gilbert River and at Georgetown, originally known as Etheridge. It is most likely that Daintree named the locality Etheridge, as Robert Etheridge senior (1819-1903) was a prominent palaeontologist to the British Geological Survey and his son, Robert (1846-1920) was assistant field geologist to the Victorian Geological Survey, being appointed to the position four years after Daintree's departure from Victoria. By 1869 prospectors entered the Etheridge area, followed by hopeful storekeepers, and by the middle of the year the Gold Commissioner estimated the population at 3000. A major gold reef was found in 1870 at Etheridge, but by 1872 the place was renamed Georgetown in honour of the local gold commissioner. The town was on the Etheridge River – a name which continues – and it was revived in 1919 when the name of the shire was changed from Einasleigh to Etheridge. The reason was a practical one: mail addressed to Einasleigh Shire was being sent to Einasleigh township instead of the shire offices at Georgetown. The Etheridge and associated gold fields were frequently overshadowed by the more spectacular Gympie, Palmer and Charters Towers gold fields. Mining records disclose a peak year of 1873 for the extraction of 121,000 ounces of alluvial gold. Lesser amounts amounting to 21,000 ounces were extracted in 1879-80. The remainder, 227,000 ounces, was produced from battery-crushing of stone between 1877 and 1890. Black resistance had been stopped by disease, opium and weight of white numbers, and government action promoted the taking up of small farm leaseholds, particularly along watercourses. A second mining invasion came with the discovery of payable copper at Einasleigh, and mining and smelting began in 1900-01. A private railway was opened in 1908 from Einasleigh to the Cairns-Chillagoe line, enabling ore to be transported to the Chillagoe smelters. 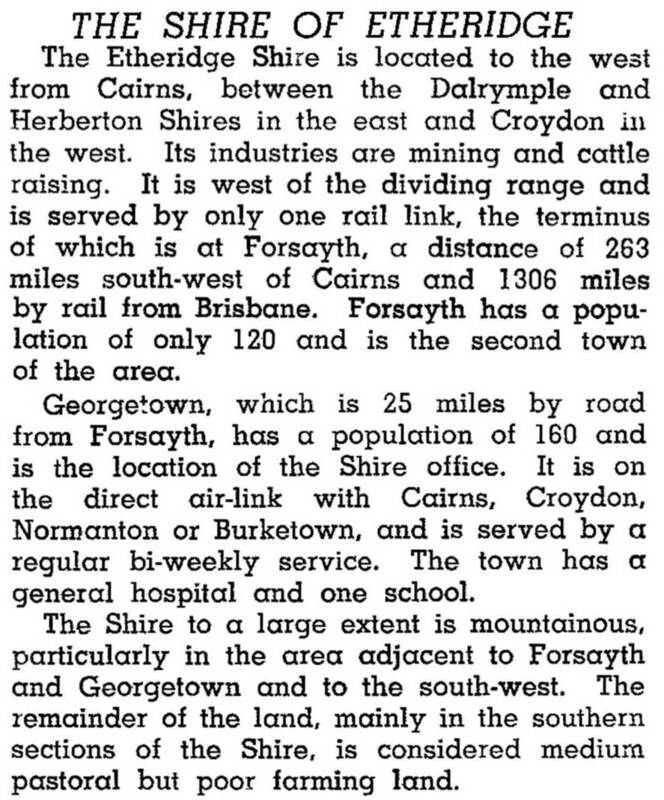 Two years later the private line was extended from Einasleigh to Charleston (now Forsayth) to tap into anther ore body. Reasonably profitable mining continued until 1914 when the Chillagoe smelters closed, not re-opening until 1919, when metal prices fell. South of Einasleigh the Kidston gold mine and battery (1921-45, 1984-2000) is a major industrial relic, and the largest open-cut gold mine in Australia. The Einasleigh local-government division (1879) became Etheridge Shire in 1919, and for most of that time local government functions were confined to Georgetown because of the difficulties of distance and the tendency for mining communities to be rough-and-ready, self-governing units. The charge of name coincided with the decline of mining and the ascent of pastoralism in the Etheridge economy. Frequent animal dipping was needed for the protection of cattle from ticks, runs needed fencing, dams had to be excavated and southern capital financed these improvements more readily than small farmers. Pastoralism's ascent was nevertheless uneven, interrupted by drought years, feral-pig and wild-horse depredations and the scourge of the Northern Territory buffalo fly. Towns around lesser mining communities completely disappeared. The private railway was taken over by the government in 1915 and, despite operational losses, it has been continued. Population centres have clustered along the line at Mt Surprise, Einasleigh and Forsayth. The fourth significant population centre is Georgetown. In 2001, 320 of Etheridge shire's 700 employed persons were in agriculture or mining, and 60 were in accommodation and hospitality, as outback touring took on. The Savannahlander train is a twice weekly tourist service to Forsayth. Agriculturally, in 1993 Etheridge was beef cattle country, with nearly 225,000 head. The only other reported agricultural product was a few hundred hectares of fodder. In 2004 the Ewamian people surrendered native title over the far northern Queensland townships of Einasleigh, Forsayth, Mt Surprise and Georgetown. In return, they received access to their traditional country through three reserves along with land and housing in Georgetown. At the 2011 census the median age of shire residents was 43, higher than the Queensland median of 36. Aboriginal and Torres Strait Islander people made up 3.5% of the population. The shire's area is 41,538 sq km.